I just liked to try again how it works and I tried to replaced the BASIC ROM with my Turbo PASCAL ROM, using the Turbo PASCAL version which does not generate a BAK file (this is important because the RAM Disk has only a size between 9KB and 20KB, and if 20KB, this costs may be too much CP/M TPA space). So I tried to generate an EPSON PX-8 ROM again, and took the utility program PROMFORM.COM - using it in my MyZ80 emulator. I had to choose 256Kx1 ROM size, and created the ROM file. But - I forgot it generates an Intel HEX file first, so I had to convert it to a binary also. This was stopped by the HEXBIN utility, because PROMFORM generated a correct formatted HEX file, but with a heading single empty line (not understood by HEXBIN). After I removed the first line, it was possible to convert it to a binary 32KByte ROM file, so I was also possible to replace the BASIC ROM file successfully. I did it first in Toshiya's HC-80 emulator (still very very useful), so I just renamed BASIC.ROM to BASIC.BAK and the TPASNOBK.ROM to BASIC.ROM. The TPASNOBK.ROM can be downloaded from >my Epson PX-8 page<. First step is set your drive you want to save the source (with "L" for "Logged Drive"). Starting with installing SuSE Linux 4.2 on a real 486 PC, I thought it would be a good idea to try it in a virtual machine, too. But guess what happens. Different errors leads in the same result - it didn't work, although console is working always, X-Server did only work with VGA 640x480 in 16 colors (not more). First I tried to install it in VMWare Player 7, but then I tried it in Workstation 6, too. 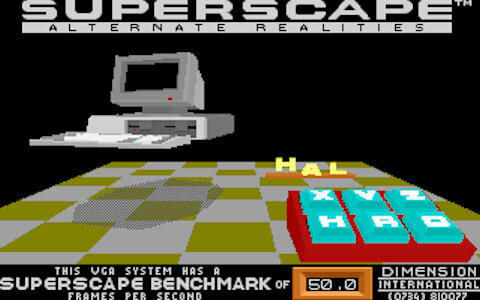 Both installation tries resulted in a working character console, but SVGA or even accelerated X-Server aren't possible. Also, "Soundblaster IDE" interface auto probe at boot time was a pain. This can be skipped by additional boot parameter "sbpcd=0", so started with the installation floppy disk, you had to type in "scsi1 sbpcd=0" always. A good idea was to try it with QEMU. But unfortunately QEMU does only support a Cirrus Logic GD5446 graphics card, and SuSE Linux 4.2 does NOT. But MS Virtual PC 2007 supports a S3 graphics chip. 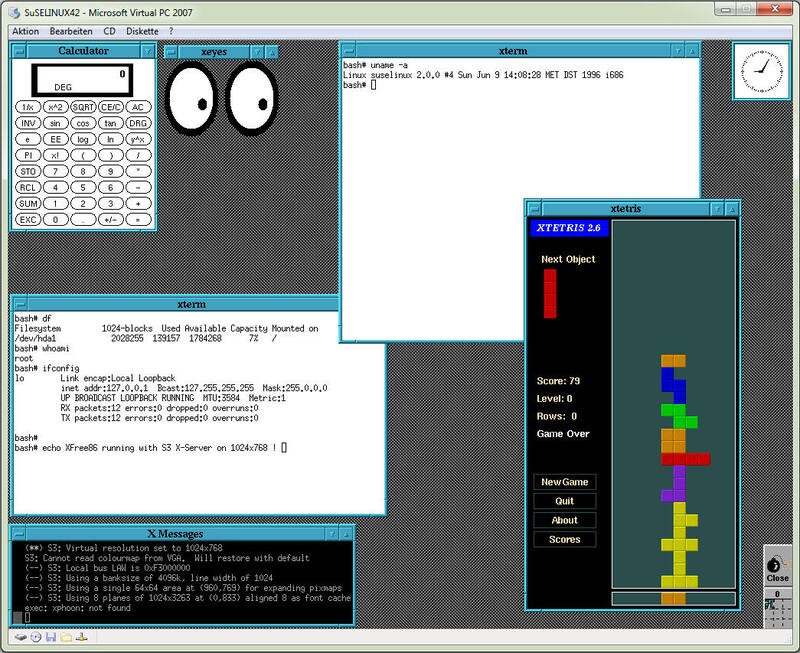 So even if you can't install it in MS Virtual PC 2007, you can prepare it in QEMU. When preparing with QEMU, choose the accelerated X-Server for S3 using xf86config, but don't try to start it in QEMU. Also, because you have to change the floppy disk images, don't forget to switch into the QEMU console to enter the "change floppy0 filename" command with Ctrl-Alt-2 and then back with Ctrl-Alt-1. 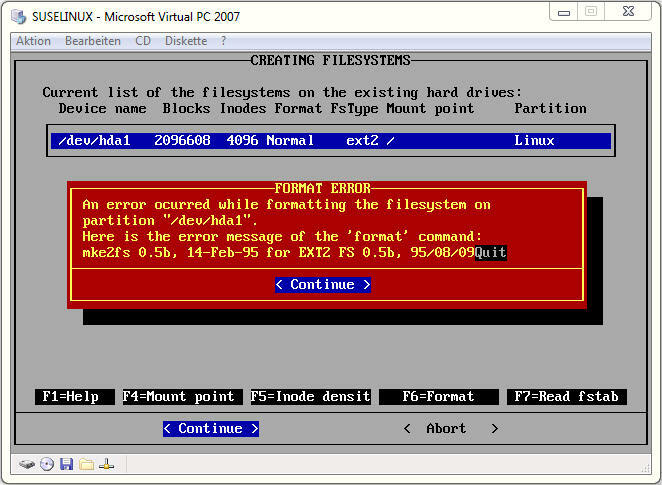 The result is a working SuSE Linux in MS Virtual PC 2007, but you can't save any file nor working with it in an usual way, because it will immediately be corrupted again. You can click on every image to enlarge it. As already expected, a S3 805 video card seems to be faster than a Trident 9400CXI (which is interestingly displayed as 9100 LCD in some tools). This can be easily checked by using two benchmark tools, one which is well known, the other is difficult to get. 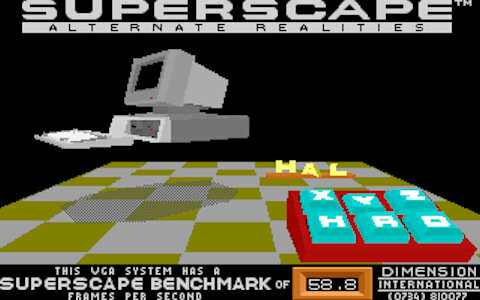 3DBENCH from Superscape in Version 1.0 (not 1.0B or 1.0C, but the first one) is suitable for older PCs below Pentium class, so my 486DX4 shows comparable values. And Wolfenstein 3D in a "timedemo" version (not the activision version !) shows it even more precise - the S3 (the Miro Crystal 10SD) is superior compared to the Trident. 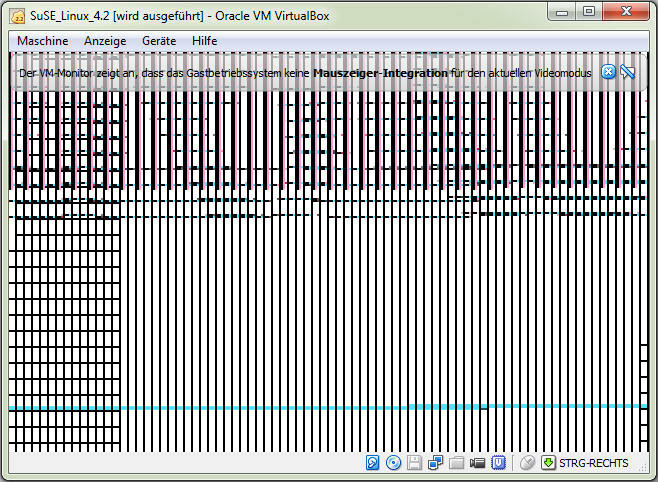 Screenshots were done with VTHIEF 0.07, viewed and again grabbed with ST201F. Btw. 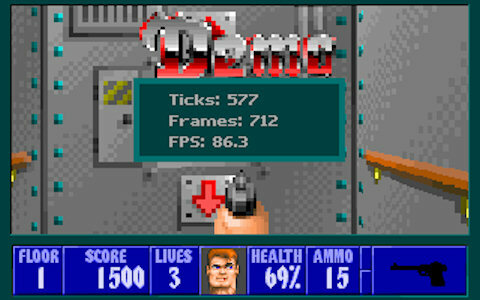 meanwhile I replaced the AMD486DX4-100 CPU with an AMD 5x86 (133MHz), this results in 66.6 fps for 3DBench (with the S3 card).